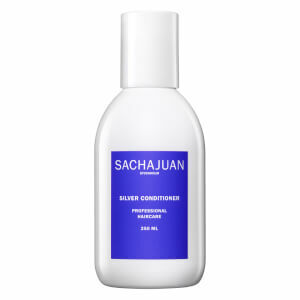 Banish brassy tones with the Sachajuan Silver Conditioner, a formula specially developed to neutralise unwanted brassy and yellow tones in blonde and grey hair. The nourishing conditioner adds pigments to the hair to help combat unwanted tones, whilst adding volume and light-reflecting shine. Its dose of Ocean Silk Technology expertly hydrates whilst protecting against UV rays which can make colour fade. Hair feels luscious, shiny and healthy. Massage into washed hair, let sit for 2-4 minutes then rinse well. Aqua (Water), Cetyl Alcohol, Behentrimonium Chloride, Stearyl Alcohol, Propylene Glycol, Glycerin, Glycereth-2 Cocoate, Chondrus Crispus (Carrageenan) Extract, Dioleoylethyl Hydroxyethylmonium, Methosulfate, Laureth-8, Succinoglycan, Dimethicone, Cetearyl Ethylhexanoate, Phenoxyethanol, Parfum, Peg-40 Hydrogenated Castor Oil, Isopropyl Alcohol, Sodium Chloride, Dimethylpabamidopropyl Laurdimonium Tosylate, Bht, Isopropyl Myristate, Ethylhexylglycerin, Hexyl Cinnamal, Citric Acid, Ci 60730, Limonene, Sodium Sulfate, Linalool, Methylisothiazolinone, Methylchloroisothiazolinone.